The South Asian Association for Regional Cooperation (SAARC) is the regional intergovernmental organization and geopolitical union of nations in South Asia. Its member states include Afghanistan, Bangladesh, Bhutan, India, Nepal, the Maldives, Pakistan and Sri Lanka. SAARC comprises 3% of the world’s area, 21% of the world’s population and 3.8% (US$2.9 trillion) of the global economy, as of 2015. After the USSR‘s intervention in Afghanistan, the efforts to establish the union was accelerated in 1979 and the resulting rapid deterioration of South Asian security situation. Responding to Rahman and Birendra’s convention, the officials of the foreign ministries of the seven countries met for the first time in Colombo in April 1981. The Bangladeshi proposal was promptly endorsed by Nepal, Sri Lanka, Bhutan, and the Maldives but India and Pakistan were sceptical initially. The Indian concern was the proposal’s reference to the security matters in South Asia and feared that Rahman’s proposal for a regional organisation might provide an opportunity for new smaller neighbours to re-internationalise all bilateral issues and to join with each other to form an opposition against India. Pakistan assumed that it might be an Indian strategy to organise the other South Asian countries against Pakistan and ensure a regional market for Indian products, thereby consolidating and further strengthening India’s economic dominance in the region. Officially, the union was established in Dhaka with Kathmandu being union’s secretariat-general. The first SAARC summit was held in Dhaka on 7–8 December 1985 and hosted by the President of Bangladesh Hussain Ershad. The declaration signed by King of Bhutan Jigme Singye Wangchuk, President of Pakistan Zia-ul-Haq, Prime Minister of India Rajiv Gandhi, King of Nepal Birendra Shah, President of Sri Lanka JR Jayewardene, and President of Maldives Maumoon Gayoom. South Asia Association of Regional Cooperation (SAARC) Disaster Management Centre (SDMC-IU) has been set up at Gujarat Institute of Disaster Management (GIDM) Campus, Gandhinagar, Gujarat, India. Eight Member States, i.e. Afghanistan, Bangladesh, Bhutan, India, Maldives, Nepal, Pakistan and Sri Lanka are expected to be served by the SDMC (IU). The SDMC (IU) is entrusted with the responsibility to serve Member States by providing policy advice, technical support on system development, capacity building services and training for holistic management of disaster risk in the SAARC region. The centre also facilitates exchange of information and expertise for effective and efficient management of disaster risk. The SAFTA Agreement was signed on 6 January 2004 during Twelfth SAARC Summit held in Islamabad, Pakistan. The Agreement entered into force on 1 January 2006, and the Trade Liberalisation Programme commenced from 1 July 2006. Under this agreement, SAARC members will bring their duties down to 20 percent by 2009. Following the Agreement coming into force the SAFTA Ministerial Council (SMC) has been established comprising the Commerce Ministers of the Member States. In 2012 the SAARC exports increased substantially to US$354.6 billion from US$206.7 billion in 2009. Imports too increased from US$330 billion to US$602 billion over the same period. But the intra-SAARC trade amounts to just a little over 1% of SAARC’s GDP. In contrast to SAARC, in ASEAN (which is actually smaller than SAARC in terms of the size of the economy) the intra-bloc trade stands at 10% of its GDP. The SAARC Youth Award is awarded to outstanding individuals from the SAARC region. The award is notable because of the recognition it gives to the Award winner in the SAARC region. The award is based on specific themes which apply to each year. The award recognises and promotes the commitment and talent of the youth who give back to the world at large through various initiatives such as Inventions, Protection of the Environment and Disaster relief. The recipients who receive this award are ones who have dedicated their lives to their individual causes to improve situations in their own countries as well as paving a path for the SAARC region to follow. The Committee for the SAARC Youth Award selects the best candidate based on his/her merits and their decision is final. SAARC does not have an official anthem like some other regional organisations (e.g. 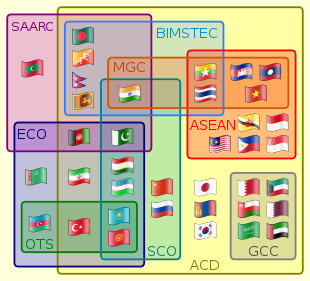 ASEAN). A poem by poet-diplomat Abhay Kumar spurred a search for a better SAARC anthem. Nepal’s foreign minister has expressed the need for an SAARC anthem to connect SAARC nations. Nepal at the 18th summit in Kathmandu in November 2014 planned to introduce proposal for an SAARC Anthem in the agenda of summit when heads of all member states meet here. “Curriculum Vitae Of H. E. Mr. Amjad Hussain B. Sial Secretary General Of SAARC”. SAARC Secretariat. Archived from the original on 13 October 2017. Retrieved 12 October 2017. ^ “World Urbanization Prospects — Population Division — United Nations”. un.org. Archived from the original on 18 February 2015. Retrieved 17 February 2015. ^ a b c “Report for Selected Countries and Subjects”. imf.org. Ahmad, Naveed (6 August 2016). “Rest in peace SAARC: The tug of war between India and Pakistan”. tribune.com.pk. The Express Tribune. Archived from the original on 7 August 2016. Retrieved 7 August 2016. ^ “Charter of SAARC”. SAARC Secretariat. Retrieved 10 November 2013. ^ Center, Asia Regional Integration. “South Asian Free Trade Area Free Trade Agreement”. aric.adb.org. Retrieved 2018-03-02. ^ “12th SAARC Summit Islamabad: History and Evolution of SAARC”. Archived from the original on 4 March 2016. “History and mission of SAARC”. Daily News. Colombo. 1 August 2008. Archived from the original on 10 November 2013. Retrieved 10 November 2013. Muhammad, Jamshed Iqbal. “SAARC: Origin, Growth, Potential and Achievements” (PDF). National Institute of Historical and Cultural Research in Islamabad. Archived (PDF) from the original on 11 November 2013. Retrieved 11 November 2013. “A Brief on SAARC.” South Asian Association for Regional Cooperation. Archived 2 December 2008 at the Wayback Machine No date. See for a complete historical account of SAARC e.g. Michael, Arndt (2013). India’s Foreign Policy and Regional Multilateralism (Palgrave Macmillan), pp. 57–112. ^ “History and Evolution of SAARC”. Jang Media Research Unit. Archived from the original on 11 November 2013. Retrieved 11 November 2013. ^ “About SAARC”. SAARC Secretariat. Archived from the original on 11 November 2013. Retrieved 11 November 2013. ^ a b “1st Summit Declaration” (PDF). SAARC Secretariat. Retrieved 10 November 2013. ^ “Report for Selected Countries and Subjects”. imf.org. ^ “Net enrolment rate, primary, both sexes (%) – Data”. worldbank.org. ^ “Gross enrolment ratio, secondary, both sexes (%) – Data”. worldbank.org. “Regional Overview of Food Insecurity: Asia and the Pacific” (PDF). Food and Agriculture Organization of the United Nations. 2015. Archived (PDF) from the original on 24 September 2015. Retrieved 2 June 2015. ^ “South Asian Association for Regional Cooperation”. SAARC Secretariat. Retrieved 27 June 2014. “Afghanistan keen to join SAARC”. rediff web services. 28 August 2005. Archived from the original on 11 November 2013. Retrieved 11 November 2013. “Afghanistan inducted as 8th member: 14th Saarc summit begins”. Dawn. 4 April 2004. Archived from the original on 11 November 2013. Retrieved 11 November 2013. ^ “South Asia: Afghanistan Joins World’s Largest Regional Grouping.” Radio Free Europe/Radio Liberty, 3 April 2007. ^ “Cooperation with Observers”. SAARC Secretariat. Retrieved 8 March 2014. ^ “Sri Lanka, 7 – 30 – 2008: Australia and Myanmar to admit as SAARC observers – Sri Lanka official”. ColomboPage. ^ “Cooperation with Observers”. SAARC Secretariat. Retrieved 16 November 2012. “SAARC to grant observer status to US, S Korea, EU Archived 10 December 2008 at the Wayback Machine Archived 10 December 2008 at the Wayback Machine.” Hindustan Times. 2 August 2006. Waliur Rahman. “US and S Korea to observe SAARC.” BBC News Archived 12 April 2006 at the Wayback Machine, 11 April 2008. ^ “Iran requests for observer status in SAARC”. China Daily. 4 March 2007. ^ a b “Russia, Turkey seek observer status in SAARC”. The Economic Times. IANS. 16 February 2014. Archived from the original on 23 June 2017. ^ “SAARC nations call for transparency in social sector”. thaindian.com. ^ “Features | Online edition of Daily News – Lakehouse Newspapers”. archives.dailynews.lk. Retrieved 2017-06-05. “Saarc Secretariat”. Archived from the original on 9 August 2017. Retrieved 8 August 2017. ^ a b “South Asian Association For Regional Cooperation — Apex and Recognised Bodies”. saarc-sec.org. ^ “SAARCLAW — South Asian Association for Regional Co-operation in Law”. saarclaw.org. ^ “The Nobel Peace Prize for 2012”. Retrieved 12 October 2012. “SAARC conference in Pakistan postponed”. Archived from the original on 10 February 2017. Retrieved 21 January 2017. “SAARC summit to be called off as Dhaka, Kabul and Thimphu too slam Islamabad”. 29 September 2016. Archived from the original on 26 December 2016. Retrieved 21 January 2017. “Saarc summit collapses after India and three other members pull out”. 28 September 2016. Archived from the original on 28 October 2016. Retrieved 21 January 2017. “Saarc summit in Pakistan postponed after member states pull out”. 28 September 2016. Archived from the original on 1 February 2017. Retrieved 21 January 2017. ^ “South Asian Association For Regional Cooperation — Area of Cooperation”. saarc-sec.org. “SAFTA meet likely next month”. 25 March 2016. Archived from the original on 2 February 2017. Retrieved 22 January 2017. “ADB urges Safta to exploit rich trade potential of member countries”. Archived from the original on 2 February 2017. Retrieved 22 January 2017. Ranjan, Prabhash (8 September 2016). “Coming closer together for trade”. The Hindu. Archived from the original on 3 December 2016. Retrieved 22 January 2017. ^ “South Asian Association For Regional Cooperation — SAARC Visa Exemption Scheme”. saarc-sec.org. ^ “South Asian Association For Regional Cooperation — SAARC Award”. saarc-sec.org. ^ “SAARC Literary Awards”. Foundation Of SAARC Writers And Literature. Archived from the original on 3 November 2013. Retrieved 2 November 2013. “Apex and Recognised Bodies”. SAARC. Archived from the original on 30 May 2013. “404 Error”. Archived from the original on 2 February 2017. Retrieved 21 January 2017. ^ “Press Releases, 18th SAARC Summit Declaration, 27 November 2014”. SAARC. Retrieved 2 December 2015.